Marks of Excellence are essentially Mastery badges that look at player damage + assist damage instead of experience. 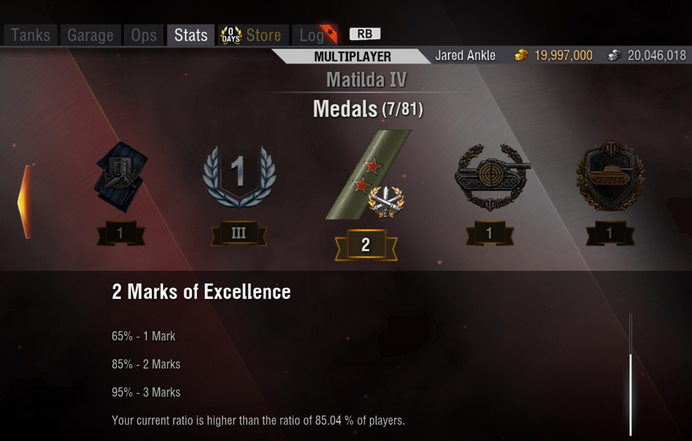 Like Mastery Badges, they can only be awarded if a player achieves more damage per game than a percentage of the entire player base. The server takes the average damage over the past 14 days from all players who have played that tank and compares it against the player’s average damage after each battle. What does all this mean? The damage and assist damage you earn after each battle will be compared against the average for that tank across ALL battles in the past 14 days. If your average is higher the required percentage of the global average, you’ll earn a mark! Let’s say the top damage + assist damage for the IS-6 per match is 7000 points of damage. To get the first mark, you need higher than 65% of that, which is 4500. 85% is 5950 and 95% is 6650. Remember it’s the average of damage dealt + assist damage! Players who have already earned a Mark of Excellence can now track their progress towards the next one with the addition of progress percentages. The progress will be shown in the Stats Log, per vehicle: "Your current ratio is higher than the ratio of X% of players." At the moment, only players that have already earned a Mark of Excellence will be able to see the progress towards the next one. Players without a Mark on any tank will not be able to see their percentage while they try to earn the first Mark. This will be changed in a future update to allow all players to view their progress percentage even if they do not currently own a Mark. Tier V tanks or higher only. Minimum of one battle to be eligible to earn a mark. Once a player earns a mark, they will always have it. Players may see marks awarded again in a battle. This works similarly to Mastery badges. Stats tab displays highest Mark(s) and current percentage for that tank if you’ve earned a Mark. Support for players who are trying to earn their first mark will be added soon! Historically, gun marks were typically earned only by tank aces, so earning them in World of Tanks is deliberately demanding. To earn the first of three marks for a specific tank, you'll have to break into the top 35% of players using it; for the second and third tiers you'll need to rank in the top 15% and 5% respectively. !!UPDATE!! For even more detailed information on MOE, please this link: MaxChaos24 Explains! Since you said a minimum of one battle is required to be eligible. Does this mean, theoretically, someone could buy a new tank, take it into battle and let's say they do AMAZING in it, (Rad or a Pool's), with 8-10K damage... they could earn one or more MoE because their average is so high compared to other players who have more games but lower averages? Or in practice to you need X amount of battles before one appears? I ask because there are conflicting reports on this. It took me 50ish battles to earn 1 MoE on a Hydra, (example), but it took me 1 battle in my Leo 1, (after I hadn't played in a very long time). Edited by WrathofAchilles, 07 October 2015 - 10:32 PM. Now if only people could see this thread, before they create one about MoE. Nah, not gonna happen anyway. How I understand it, that tank is eligible to earn MoE when the requirement of minimum one battle played is completed. This being said, you wouldn't be able to earn one on first battle, but the one after. How I understand it, that tank is eglible to earn MoE when the requirement of minimum one battle played is completed. This being said, you wouldn't be able to earn one on first battle, but the one after. I got my 1st mark on my Deathstar after my 1st match in it since MoEs started recording. So the very best IS-6 player in the universe's average is used to calculate 65%, 85%, and 95%? Weird. We started recording in an earlier version before the marks were displayed. My question is: If a new tank is released does the first person to complete a game in it automatically recieve 3 marks which they get to keep forever even if they're a completely subpar player in that tank? Do you mean before we started seeing them in our AARs post game they started being recorded? Or did you mean before we started seeing them on our tank barrels? Before the update we knew about them. Yeah same question. I do remember WG adding MoE without the art. But if they were recorded before even adding the feature, then it would explain why some people earned them very fast after update. I believe you are eligible on your 2nd battle. RC Landon can you confirm? It would be nice if maybe in the next update u can add an actual figure. Considering its all being calculated i cant see it as much of a problem, but it would be nice to see 7k being the highest damage for the 14day spam and 4k is what you are currently averaging... The percent aisle is nice but we are always guessing what our average currently is. No, it takes 14 days of data first. The damage and assist damage you earn after each battle will be compared against the average for that tank across ALL battles in the past 14 days. If your average is higher the required percentage of the global average, you’ll earn a mark! This part is confusing. They state two VERY different things. First, you say that you are comparing to an average. Then you follow by saying you are comparing with a percentage of the best single player. Average does not equal percentage of top. (edit) I suppose you could say you are comparing against the top player's average. That would make some sense, but if this is the case please adjust the wording to reflect accordingly. If it is indeed a percentage of the bar set by the top then that means it is a linear progression, which is easier for us to track/anticipate. A question here though - is there a minimum number of games required to count as the top player average for that tank? If not, then someone who plays once and has a stellar game will wreck the curve for everyone else. If there is a minimum to count for setting the bar, what is it? Edited by Pontiac Pat, 07 October 2015 - 11:08 PM. So, are you saying that nobody gets an MoE the first 14 days after a new tank is introduced? Since you're here, is it possible for a tank that's been around a while, to not have the third mark? Ie is it possible for all tanks in a group (tortoise for example) to only have 0,1, or 2 marks? Or, they way math works, at least one person will always have a third mark?